The Mom Standard: Olive Oil, don't skimp! I use Olive Oil like the dad in My Big Fat Greek Wedding used Windex. It's my daily facial moisturizer, furniture polish, cat treat, natural stool softener (OK, that's a bit gross I know, but trust me, it works. Especially for toddlers and babies...just a little spoonful will have them back on "the move" in no time), baking fat, and much, much more. 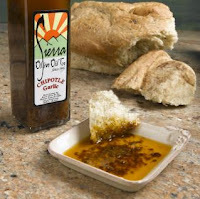 All this being said, FromTheFarm.com offers some delicious high quality Blended Olive Oils ! Hand produced to ensure freshness and quality, the blended oils of Sierra Olive Oil are so good you will want to use them on everything. Without any additives, preservatives, chemicals, or heat used during extraction, these oils are perfect for dipping, dressing, marinades, and cooking! Shop the several Award-Winning flavors now! Your blog is amazing. So looking forward to read more!